The Onion. May 19, 2010. Added Obama, "At this point, the only positive thing I can say about the American people is that I'm pretty sure they've never rigged an election in their favor. A few weeks ago an an anonymous commentator left a rather angry tirade on one of the Stage's more popular posts. Anonymous was upset with one of the post's central conclusions: "Across the board, Americans are woefully ill informed in the fields of science, civics, and history." Our friend had trouble accepting this claim, despite the volumes of empirical data that support it. Those who propagate it, said he, "had bought into the narrative." They are tools of "the Leftist/tranzi elite" who possess a "contempt for America." I found this exchange disquieting. This was not because the comment itself was particularly well argued. To the contrary, the critique was of little substance and its criticisms were met with no difficulty. I fear, however, that the words of Anonymous are symptomatic of a much larger problem facing American society. Those on the left wax poetic when called to decry the evils of the industrial-military complex or the ways in which energy companies manipulate public opinion on matters of environmental stability. The right matches these harangue for harangue, though their chosen target is more oft the network of liberal educators, newsmen, and politicians who preside over the nation's largest and most important public institutions. On the face of things these narratives could not be more different. Their essence, however, is the same. In lockstep both forgo responsibility for our current state of affairs. The woes of America are no fault of ours, but theirs. It is them and their manipulations that have caused this time of troubles. Evil is a consequence of The Other. In saying this I do not mean to deny the existence of a rentier class, manipulative newsmen, corrupt executives, or the many fingers of the military industrial complex. These are all real and present dangers whose existence is noxious to our Republic. But it is essential that Americans realize this truth: the presence of these ills was not imposed from the outside. These are not creations of the other. The demons are our own. I have heard some say that they are lucky to live in a country free as this. To them I say: luck has had nothing to do with it. Greatness is made, not given. Freedom is not placed well prepared on a silver platter; it is fought for. Neither liberty nor equality are the default settings of the human condition, and what we have of them are the fruits of generations worth of labor. If we too do not labor, we will lose them. Our elected officials are held to account by the people of this nation. Our businessmen have no profit save that what they can obtain through the investments, consumption, and production of this people. They are made by us. If politicians deal in punditry and prattle, it is because the people of this nation cannot tell the difference between propaganda and principle. If the government can strip away our rights liberty by liberty it is because we do not value them. If statesmen, executives, and pressmen treat Americans like sheep it is because that is what we have become. A firm belief of mine is that one of the greatest tasks facing this generation is the meaningful reform of America's federal legislative system. We live in a time dominated by independent government agencies, imperial presidencies, and unabashedly insular party machines. In such an environment it is all too easy for the legislature to become an appendage - an afterthought. What was designed to be the depository of the people's will, a forum for serious political discourse, and the wellspring of national policy has degraded over the centuries. What we now possess is a binary legislature that alternates between the role of rubber stamp and road block depending upon which party is in the majority. What should rightly be the tool of the states and the people has become a tool for the parties and the interests that back them. I have thought about this issue a great deal, and I could write about it a great deal more. This post will limit itself to the Senate, and submit a potential solution to the maladies that ail it. Mr. Woebegone Goes to Washington: When Did the Senate Become Such a Cynical Place? Jessica Senior. New York Magazine. 1 April 2010. But if you look at the Senate of today, all of those structural differences pretty much amount to nothing. The Senate has capitulated entirely to popular sentiment, or (in Madison’s words again) “popular fluctuations.” Just look at that tea-party-inspired amendment spree, or the senators’ repeated declarations that health-care reform ought not to pass because polls showed that people were against it. The institution is plenty “factious” and “intemperate”: A number of Democrats I spoke to noted that they couldn’t remember a single Republican on the floor when Tom Daschle, the former Senate majority leader, made his farewell speech, in 2004. And those six-year terms aren’t exactly providing much intellectual stability. How could they, when a contentious Senate race—Daschle’s, for instance—can cost upwards of $20 million, forcing senators to chase money hour to hour, month to month, year to year? The Senate, in short, has become another House of Representatives. In fact, almost half of today’s Senate—49 percent—is made up of former House members (as opposed to 1993, say, when the number was 34). During health-care week, it was the House that tuned out the polls and the Senate that went into partisan overdrive—pouring forth talk-radio cant, shutting down government (right out of Newt’s playbook), and pinning as many amendments onto this donkey as was legislatively possible, all in an effort to beat back a bill that, like a common bill in the House, required just a bare majority vote. Senior seems surprised that the Senate has become a second House of Representatives. She should not be. We have thrown out the institutional checks the framers designed to prevent the Senate from becoming slave to 'popular fluctuations.' It was only a matter of time before the norms that maintained the Senate's dignity were also discarded. The institutional check I refer to is the original method by which our senators were chosen. While the members of the House of Representatives were chosen directly by the people, the senators were chosen by the legislatures of the states they represented. Senators were not thought of as representatives of the people, but as delegates from the states. Not unlike today's diplomats, the only link between these statesmen and the people they represented were the governments the latter had elected. This connection was a tenuous one. As the prominence of state governments on the national stage receded over time the number of people comfortable with the role these governments had in selecting their representatives grew smaller. The end result was the Seventeenth Amendment, which brought senatorial elections to their current form. The consequences of this change are worth reflection. The amendment is usually championed as a triumph of democracy and direct representation. And so it was, when first implemented. Yet the amendment has not aged well. A century of population growth and technological progress has changed the nature of our political system in ways the original writers of the amendment could not have foreseen. Popular election was supposed to weaken state political machines, reduce corruption, and place the mass of the citizenry upon a commanding height where none could touch them. This has not happened. Corruption on the state level was simply replaced by corruption on the national level. Senatorial elections have became national affairs; the senators who win are those who gain the financial and political support of the corporations, donors, and politicians from the nation's cashpots. The direct representation promised by the Seventeenth Amendment has proved itself to be illusionary. An America without the Seventeenth Amendment is an America where senators would not spend the majority of their time on the campaign trail. In Ms. Senior's terms, they would be less like demagogues and more like statesmen. An America without the Seventeenth Amendment is an America where special interest groups, corporations, and big donors wield little influence in the Senate chambers. Absent popular campaigns and there is little need to fill the campaign chest. An America without the Seventeenth Amendment is an America where the senators care about their government on the state level. This would kill the growing Parliamentism of American politics; a senator elected by the legislature identifies with his constituents more than he does his party. An America without the Seventeenth Amendment is an America where power is more equitably distributed across the nation. It would be a strong first step towards ending what one writer has termed "The Tyranny of Washington, D.C."
I ask my countrymen to put this matter at the forefront of their thoughts. If a Republic truly cannot thrive without a body of restraint, experience, and reason to temper its passions and politics, then we must find a way to instill these traits into the form of our government. The current model fails in this task. Perhaps it is time we consider restoring the institutions that will not. Hillary Rodham Clinton. U.S. State Department: Secretary's Remarks. 25 May 2010. 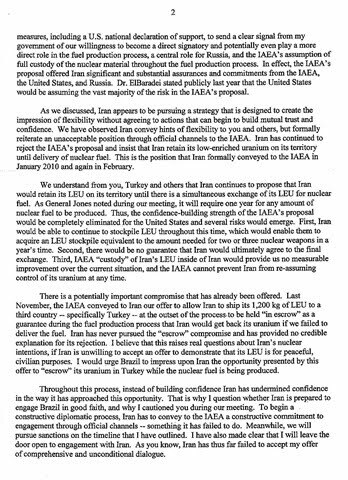 We discussed at some length the shortcomings of the recent proposal put forward by Iran in its letter to the IAEA. There are a number of deficiencies with it that do not answer the concerns of the international community. There is no recognition of the deep concern people have because of the 20 percent enrichment that Iran is pursuing. 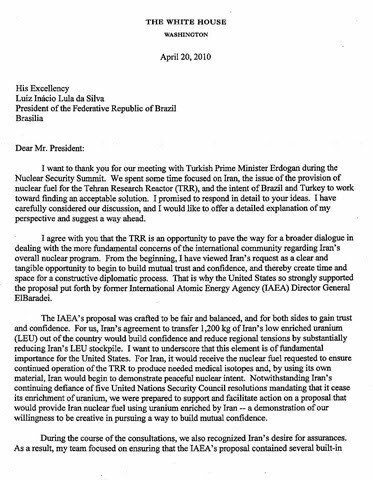 There is a recognition on the part of the international community that the agreement that was reached in Tehran a week ago between Iran and Brazil and Turkey only occurred because the Security Council was on the brink of publicly releasing the text of the resolution that we have been negotiating for many weeks. It was a transparent ploy to avoid Security Council action. This is about as damning as diplomatic discourse can get. The only thing worse would be directly attacking the statesmen involved. Incidentally, this is exactly what Secretary Clinton did today. It seems that the Brazilians have had enough. President Lula, the man who engineered Brazil's entry to the great power club, is approaching the end of his presidential career. It is no great secret that he wishes to end his incredibly popular Presidency on a high note. He has looked long and hard for an opportunity to show the world the greatness Brazil has attained during his time in office, and Iran offers him just that. Given what he has put into this project, it should come as little surprise to see Mr. Lula and his administration voraciously protesting American attempts to end his parade. 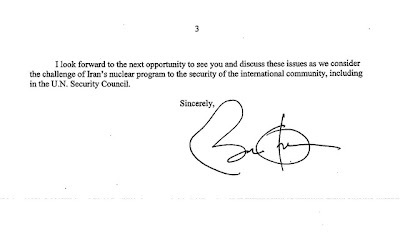 It seems that Mr. Obama was for this deal before he was against it. I am left with but one question: how did this happen? Did anybody at Foggy Bottom or Pennsylvania Avenue question why the President should authorize tirades against the evils of Brazilian foreign policy when he had already given the Brazilians the only thing they needed to destroy any shreds of legitimacy our criticisms might have had? Our foreign policy-making apparatus is a mess - no more evidence is needed to establish this point. When perched upon a petard one must play carefully with fire. We gladly gave our competitors a match. T. Greer. Scholar's Stage. 10 January 2010. Another tale from the world of broken diplomatic machinery. Dilip Hiro. TomDispatch. 27 May 2010. Hiro catalogs a series of diplomatic missteps where the United States overestimated its power and then found itself out maneuvered on the international stage. While the title faults Obama, the problem extends much deeper than one man. The United States emits more C02 in six seconds than Somalia does in two days. Breathing Earth is simulation that displays the number of deaths, births, and tons of CO2 emitted in every country on the Earth in real time. It is more than worth a quick look. Hannah Rosen Atlantic Magazine. July 2008. Over the last decade crime rates in New York, Los Angeles, Miami, and Chicago have all shrunk. A great American success story? Not quite. While the crime rates of the big cities fell, the prevalence of gang wars, drug routes, and sexual assaults skyrocketed in the suburbs. Today it is Memphis, Kansas City, and Nashville that top the homicide lists. Hannah Rosen explains why this transformation took place. The Committee for a Responsible Federal Budget. There seems to be a bipartisan consensus on this issue: the debt needs to be stabilized. But just how should we do that? The Committee for a Responsible Federal Budget has developed a simulator that lets each user try and stabilize the debt themselves. It is harder than most think. "Will". League of Ordinary Gentlemen. 15 May 2010. It is common wisdom that the one thing government consistently does right is public transportation infrastructure. It seems the common wisdom is wrong. Rapheal Cohen. World Affairs Journal. April 2010. An intelligent thought piece on the ways in which our current wars will change the way policy is made in the future. John Burnnett, Marisa Penalosa, and Roberto Benincasa. NPR. 19 May 2010. An NPR News investigation has found strong evidence of collusion between elements of the Mexican army and the Sinaloa cartel in the violent border city of Juarez. This is a huge story. Completely ignored by most parts of the American press, but incredibly significant nonetheless. It is worth remembering that we have agreed to help bankroll Mexico's war against the drug dealers. If what NPR reports is true, this was a mistake. The end goals of Mexico City and Washington are simply not compatible. The Mexicans want peace, and are willing to give on cartel a monopoly to achieve it. The Americans want to break the cartels before they get the chance to become entrenched in the United States. It is in Washington's interest to wage the drug war as far away from American streets as possible. Mexico City does not want to wage our wars, and no amount of aid money is going to convince them to do it. Drug War or Drug Deal? Mexico's Biggest Cartel Banks on Powerful Friends. Bruce Liverly. Montreal Gazette. 22 May 2010. "Buggs". Borderland Beat. 20 May 2010. Ethan Gutman. World Affairs Journal. May 2010. One hears a lot of talk these days concerning the coming revolution of decentralized warfare. While the West has been arguing about it, the Chinese have been perfecting the art. Gutman's history of Chinese hacking - from the first clumsy attempts a decade ago to Party's legion of cyberwarriors now - shows just how states can leverage these processes for their advantage. It is a scary read. "Boz". Bloggings by Boz. 25 May 2010. 1,200 American servicemen have been sent to the U.S.-Mexican border... but to what point and purpose? As Boz points out, the strategic logic behind this decision has not been explained to the public. Given past history, it would not surprise me if these questions have not been answered because the men at top have simply do not have any to give. Richard Joseph and Alexander Giles. Brookings Institute. May 2010. A thorough overview of Nigeria's recent political history and the problems it will cause for President Goodluck Jonathan. Yigal Scheifer. ISN. 25 May 2010. On issues of privacy the tide might just be turning. Britain's new ruling coalition has expressed concern with that country's absurdly high number of CCTV units; these protests in Turkey suggest that such concerns are global in nature. Ashok Malik. Open Corner. 18 May 2010. Harsh Pant. Outlook India. 18 May 2010. China, as seen by the India. I recommend both articles to the armchair geopoliticians among the readership. Nirmalangshu Mukherji. Outlook India. 19 May 2010. This is the most valuable article I have read on the subject of the Naxalism this year. Mukherji's editorial is a synthesis of hard-hitting analysis and a wide survey of the available literature. Taking a wide range of CPI-Maoist party documents, government reports, and eye witness accounts of the tribal interior where the insurgency thrives, Mukherji deftly slices apart the myth that the Naxals are helping the Adivasi. Granted, as long as the Indian government persists in doing things like this, reports of this type matter little. It is still useful for those seeking to understand the dynamics of this conflict, however. Andy Revkin. Dot Earth. 19 May 2010. A paper published in Nature definitively ends an argument many an advocate of a carbon emissions scheme has used: the clear connection between rising temperatures and high levels of malaria. The problems with this argument should be obvious to any with a sense of history (in the colder world of the 1800s both Illinois and St. Petersburg were notorious for the ague), but this paper goes beyond these limited examples by examining malaria rates on a global scale. "Fabius Maximus." Fabius Maximus. 14 May 2010. A useful round up on the Deepwater Horizon oil spill and the methods that have been deployed to try and manage it. Claire Berlinski. City Journal. Spring 2010. In the past decade several men have risked their lives stealing top-secret documents from the Kremlin's archives. While they received political asylum, there has been no interested in the translation or publication of their contents. Americans, it seems, like to leave our past behind us. (H/T War News Updates). Lenn Evan Goodman. Journal of American Oriental Society, Vol 92, No 2. April 1979. Editors. Atlas Obscuria. Last edited May 2010. Of late this corner of the blogosphere has been quite keen on the ideas of Ibn Khaldun. For the most part those discussing these ideas learned of them not in their work of origin, The Muqaddimah, but through well written intermediaries. * While I find no fault in this (I am far too guilty of this crime to fault others for it), I have always felt that it is best to go to the source, particularly when a work is as old as this one. You can thus understand the absolute sense of delight I felt upon finding the Franz Rosenthal's three-volume translation of The Muqaddimah sitting on the shelf of my local library. You can buy an abridged version of this translation on Amazon.com for $1.99, but the original three-volume set will cost you more than $300. 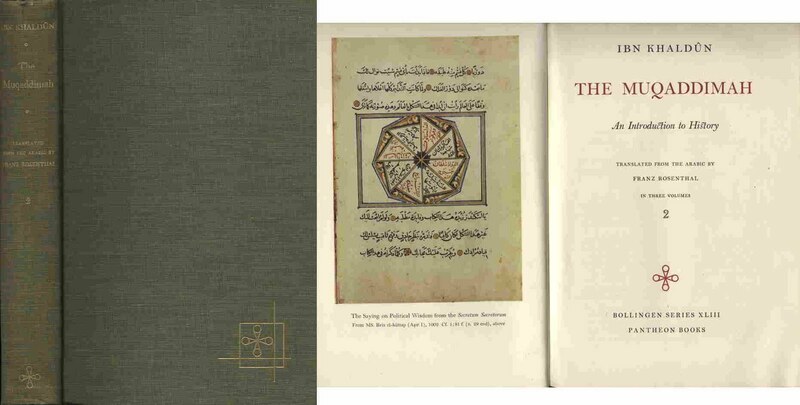 Not wanting to spend $300 for one title, I had decided to place The Muqaddimah at the back of my reading list until I found a cheaper copy or was ready to go through the hassle of an inter-library loan. This discovery happily spared me the bother of both options. To make things even better, next to the three volume set was Charles Issaawi's An Arab Philosophy of History: Selections from the Prolegomena – an entirely different translation of The Muqaddimah whose existence I was completely unaware of! Quite understandably, I have checked out all four of the books from the library. As the amount of reading involved is on the larger side (+1500 pages) and my schedule is rather cramped, I announce my intent to stay away from the blogosphere until I have finished Khaldun's opus. I have a rare free weekend in front of me, and if I do not waste the opportunity I am fairly confident that I will be able to read The Muqaddimah one end to another before next Tuesday. In my absence, I encourage my readers to post a take a moment and leave a quick reply in the comments section of an earlier post, A Poll For the Readership. When I return to the blogging world it will be what I look at first to determine what I shall write about next. *Peter Turchin's War and Peace and War and a surprisingly thorough Wikipedia entry being the two most commonly cited. The following words were written earlier this night by the editors of War News Updates. I copy them here without alteration. "Brookyards." War News Updates. 13 May 2010. WNU Editor: In one email, Michael Yon has summarized what I have been trying to say for the past few years .... we are losing the war in Afghanistan, and no one back home cares .... and worse, our leaders are trying their best to cover it up. I have reprinted his email below. Sometime last year I stumbled across a series of 500 word think pieces written by various professors of international relations, senior fellows housed in foreign policy think tanks, and other eminent experts on all matter of topics related to security studies. From what I could tell the series was a weekly affair; every week a new topic would be proposed and interested experts would write a reply, send it in, and have it published as the week closed. The week I stumbled upon the site was was unique, however: the topic chosen had received so many responses that the editors deemed it necessary to extend the discussion over two weeks. The topic that swamped them? "What should be America's grand strategy?" Unfortunately, I did not bother to save the url of the series and have been unable to find it since. * The loss is not too great, however; the series' pattern was tragically familiar. Indeed, not a year goes by that we do not see it repeated in the publishing houses and public policy journals of America. Treatise after treatise was sent in, each painting its own picture of the perfect strategic outlook, an optimal configuration of alliances worth forging and enemies worth engaging, and an idealized list of national interests whose pursuit would surely secure American supremacy and security in the future. Like most works of this type, I had trouble taking any of them too seriously - every American with a passing interest in international affairs seems to have an opinion on matters of grand strategy, but few have had the experience necessary to make these opinions worth hearing. Most books and articles on the subject are simply dressed up wishlists, ultimately saying more about the author's political fancies than America's strategic realities. Not surprisingly, these books have no lasting permanence. Each is published, lauded by the foreign policy literati, and then abandoned as the next batch of strategic self-help books comes hot off the press. Why is this? What accounts for America's ever-growing graveyard of unused grand strategies? Ambition plays a part, I am sure. Kennan's legacy is a siren's call for experts and analysts more confident than they have reason to be. However, I think the problem is more fundamental than this. The grand strategists of our age have built their policies upon a dangerously flawed foundation. Again and again they try to graft their strategies onto the Republic and are forced to watch as America rejects every one of them. They fail to realize what they are constructing is incompatible with the nature of the ground upon which they build. In the Spring 1995 volume of International Security, Josef Joffe (now a fellow at the Hoover Institute, then a professor of political science at Harvard) published an article titled "Bismarck" or "Britain"? Toward an American Grand Strategy after Bipolarity". As the title of the article would suggest, Joffe compares the grand strategies of Britain, the famous 'offshore balancer', and Bismark, the 'spoke of Europe', as possible models for America to follow in the post Cold War world. Joffe comes down decisively on the side of Bismark, arguing persuasively that the United States will be more successful if America becomes the 'spoke' every country must work through to achieve its goals than it will ever be as a reactive balancer scrambling about from continent to continent trying to build coalitions in face of every regional power house. For the reigning superpower it is better to bandwagon than it is to balance. On the face of things this seems quite sensible. Indeed, I cannot dispute the general argument Joffe makes, and enthusiastically recommend the essay to all who claim that America should play the part of Britain in the coming century. However, like most of its type, his essay suffers from a glaring omission. Never explained is why the United States should become the new Bismark. Yes, doing so will preserve the United States hegemonic status – but what is the point? For what reason does the United States wish to have this status? Why is it in in our interests to make the choice between Bismark and Britain in the first place? For Joffe these questions can be safely ignored, as they have already been answered. Scholars of the realist school addressed them long ago. In terms of interests, states have but one – survival. The key to survival in a world full of states desperate to survive is power and influence. The state with the most power and influence has the best chance of surviving. Thus it is in the interest of the United States of America to attain as much power and influence as possible – which presently means the maintenance of American hegemony across the globe. Grand strategies are the game plans statesmen use to guide their efforts to do just this. This was a simplification, but not by much. Indeed, while not all would-be strategist are of the realist school, a consensus has formed around the basic idea: a grand strategy is a state's road map for survival and security. This consensus is the first source of America's crisis in strategy. I often find historian Carroll Quigley's theory of institutional decay to be quite useful when thinking about realist conceptions of the state. According to Quiggley, all organizations are formed as a means to accomplishing a stated goal. These organizations are thus instruments whose role is limited to the function they were designed to perform. Over time these instruments tend to denigrate into institutions – organizations that exist for their own sake, devoting resources to protecting their position instead of directing resources towards the fulfillment of their designed role. When this happens they cease to be of use to those who created them. Institutional decay applies to all organizations made by the hands of men – religious congregations, businesses, bureaucracies, NGOs, and civic societies can all fall prey to its grasp. As a creation of men, states are not exempt from this rule. Indeed, as the realists see it, they have all fallen prey to it. The realist state is an organization that decayed beyond usefulness from the moment of its birth. Such a state, existing solely for survival, is not a tool in the hands of its citizens; all benefits provided by the Leviathan are simply lucky side effects of the Hobbesian contest for survival. This vision is an egregious misinterpretation of the state and its purpose. As do all organizations, states have the capacity to be instruments in the hands of those who use them. This is particularly true for those governments not founded by "accident and force", but "by reflection and choice" (Hamilton, Alexander. Federalist No. 1) – that is to say, states whose existence is explicitly instrumental in nature. If an instrument is to fulfill its role as an instrument it must survive. But survival itself is not the point. It is merely a prerequisite for the instrument's use. "Joseph Fouche". Committee of Public Safety. 9 May 2010. In Manifest Destiny and Mission in American History Frederick Merk states that the defining feature of the American polity has been its "sense of mission." Americans, says he, have always been invested in the idea that their Republic served a great purpose. They could never delegate their destiny to the realpoliticking of the upper echelons of power. In times of crisis it is this sense of of purpose that has sustained the Republic, and in achieving national goals it is this sense of purpose that has acted as the unconscious guide of American statesmen and citizens alike. Strip away America's mission, and you have stripped away America. And in doing so you have stripped away our grand strategy as well. And it is in exactly this situation that America has found herself. "Better one bad strategy consistently pursued than two good strategies inconsistently pursued." I submit that is half right. The problem is not that America's strategy is a changling, constantly mutating from one form to another. Our strategy is a inconsistent, but this is nothing new. Even containment, that most famous of grand strategies, varied wildly in form and flavor as it was handed from one generation to the next. The policies made famous by Truman, Kissinger, and Reagan were radically different from each other. Yet however different the roars of Reagan and the whispers of Kissinger may have been, in one aspect they were unquestionably united: both were devoted to the same mission. The Cold Warriors may have varied in the strategies they proposed, but their strategies were all directed towards the same end. The same cannot be said of the grand strategists of today. America's problem is not that she has too many strategies, but that she has too many purposes. There is no consensus as to what America means or why America exists. There is no commonly held sense of purpose to unite the citizens of the Republic. And absence this sense of purpose, our strategists have no foundation upon which to build. I do not imagine this will change anytime soon. Unlike strategy, purpose is not the province of brilliant men. There can be no Long Telegrams or Albert Wedemeyers for America's sense of mission. Our purpose is just as much a feeling as it is a nuanced thought process; it is decided not by the brilliance of an essay or a memo, but by the collective hopes, fears, and experiences of the entire nation. It is something we all take part in, and it is something we will all help create. This assumes, however, that Americans still have the capacity to create such a national ethos, that we possess the will to forge a consensus on our national purpose. Evidence suggests that we cannot. National ethos is dependent on national identity. And as a previous post on this topic has shown, this is something Americans do not have. One fourth of all Americans believe that our nation is divided to the point where a common identity is impossible. At the same time, American participation in civic and community institutions has fallen drastically. As this previous post concludes: "Modern America is a country bereft of social capital. ** Exceeding the bounds of individualism, our tieless masses are a race of aliens. They breath the same air, live in the same space, but are aliens to each other nonetheless." A country of aliens has no sense of purpose. Without common experiences, ideals, beliefs, or identity, there is no cohesive whole to attach 'purpose' to. A whole that does not exist can have no driving mission. And no strategy can serve a mission not yet called into being. In the end, our strategy is only as strong as the nation it is built upon. Every armchair general dreams of being the one who ends the crisis in grand strategy. To meet their goal these men must dig deeper. It is not the crisis of grand strategy in want of solutions, but the crisis of American civilization itself. * Intrepid and more internet savvy readers are encouraged to to try and find it, if they are so inclined. For those interested: the format was not unlike Washington Post's On Faith. I am fairly confident that Andrew Bacevich was a contributor. Or Andrew Krepinevich. I suffer from the unfortunate tendency to mix those two very different men up. **Or for those fans of Ibn Khaldun, Asabiya. EDIT (31/08/2010): I direct any readers of this post to my "Addendum to Dreaming Grand Strategy". It turns out the last bit was a lie. This author does not have the time this week to hammer down the specifics of all these posts and get them published. But he might have the time to hammer down the specifics of some of these posts. This leaves me with a dilemma. I have some seven-odd outlines, notes, or half finished posts in my blogger workbox which, if published now, would be significantly behind the news stories that prompted me to start them. I would like to get them out of the way so I can start on new projects, but I am unsure of which I should work to finish first. Thus I offer this post as a poll for my readership. Listed below are the topics of these various posts, their order determined by the relative percentage of the post that has already been completed (i.e. posts half written are at the top; outlines are at the bottom). All post titles are tentative. "Haiti and the Washington Consensus" - An argument against those who claim that Haiti is the perfect case example of a "free market failure". "Choose Your Meme With Care" - Building on my discussion of the dangers of historical metaphors, this post looks at the perils that confront all who use metaphors to justify policy. "Mega Bills: A Disease Upon Democracy" - Lengthy legislation is deteriorating our democratic system. (Also an extension of a previous discussion). "Grand Strategy in the Post American World" - An evaluation of the grand strategy advocated by Fareed Zakaria in his The Post American World. "A New Way Forward for Global Development?" - Debating the pros and cons of the Obama Administration's draft reforms of the United State's development and aid architecture. Untitled I - Making a strange case: for its own good, as well as the good of everybody else concerned with environmental issues, the environmental lobby needs to drop climate change from their agenda. "SWAT Nation: The Implications of our War on Drugs" - Both a response to a few critics of my previous post on SWAT tactics and a broader discussion of the ways our war on drugs is tearing the Republic at its seams. Untitled II - New opinion polls show that the American people have no faith in the elite, American institutions, or America itself. Some thoughts as to why this is so. "Göbekli Tepe" - On the implications of Göbekli Tepe, the oldest man made structure in existence. Sound off in the comments to tell me which of these posts ought to be finished first. A lot of good material has been published this week. I am a bit on the busy side, so the usual long winded responses will be replaced in favor of one-sentence summaries. New York Times. 9 June 2009. A useful graphic, explaining the source of America's deficits with one clear image. It ends in 2009, and thus does not include projected deficits for the future. (H/T Fabius Maximus). Nick Nielson ("Geopoliticratus"). Grand Strategy: The View From Oregon. 9 May 2010. An operative definition for Grand Strategy on the longue duree. "Joseph Fouche". The Committee of Public Safety. 9 May 2010. "Galhran." Information Dissemination. 5 May 2010. If it is your desire to help determine U.S. Naval policy on the grand scale, now is the time to start publishing. 'Texas in Africa'. Texas in Africa. 5 May 2010. How to make development aid work: stop aiding people and start empowering them. The Indians are not happy with the outcome of the recent U.S.-Pakistani strategic dialogue, hence open speculation on ways to split up the ties between Pakistan and the United States from a respectable Indian source. Sooner or later we are going to have to choose a side and stick to it -- India cannot afford to let the United States' inadvertent attempts to erode its strategic position go unchallenged, and we are fools for thinking otherwise. Solid reporting from the Economist on the challenges internal migration poses to the CCP. Aadisht Khanna. The Stereotypist. 1 May 2010. What Panchatantra fables can tell us about international finance. (H/T The Acorn). Antoly Karlin. Sublime Oblivion. 10 May 2010. A look inside the modern Russian mind. Tobias Rapp, Christian Schwägerl and Gerald Traufetter. Der Speigal. 5 May 2010. Readers will remember that I wrote an extensive breakdown of the Copenhagen conference on climate change shortly after the conference took place. Back then I only had access to the post-conference statements issued by diplomats, reporters, and other attendees and draft documents leaked to the media during the conference. Now other material is slowly starting to leak into the public sphere - most notably a video of the Bella Center meeting between the session's most important heads of state. The portions of the video thusfar published by Der Speigal are in complete alignment with my earlier assessment; hopefully the magazine will release an unedited version of the video online soon. Who are the Real Mavericks? John Sides. The Monkey Cage. 6 May 2010. A Princeton PhD student has developed a metric for measuring the "maverickness" of American congressmen. The Monkey Cage uses it to evaluate a few prominent politicians. Mark Lilla. The New York Review of Books. 7 May 2010. Ben Abbot. American Creation. May 5 2010. On the influence Adam Smith did (and did not) have on the political economy of the founding, particularly as espoused by James Madison. Antoly Karlin. Sublime Oblivion. 5 May 2010. Three men who successfully predicted the duration and intensity of the First World War, the type of weapons with which it would be fought, or the make up of the war's alliance structure. Guns, Bows, and Arrows: What if the Continental Army had Taken Ben Franklin's Advice? Brian Tubbs. American Revolution & Founding Blog. 7 May 2010. Ben Franklin proposed that the Continental Army adopt the use of bow and arrows to save money. The video below is not pleasant. If it were shown on night time television it would likely to be cut into a 20 second made-for-TV clip with the label "viewer discretion advised" tacked onto the front. It is coarse. It is violent. It is real. My countrymen – watch this. Watch this now. And in doing so know that what you see has been done in your name. Mark Thompson. League of Ordinary Gentleman. 5 May 2010. What is so remarkable about this video is precisely that it is so unremarkable, depicting something that happens up to 40,000 times a year. Indeed, perhaps nothing proves how common this is more than the calm, cool, and thoroughly routine manner in which the agents of tyranny carry out their task, quickly disposing of the family dogs (one of which was a corgi) and filling the victim’s home with bullets within, literally, moments. All in front of what looks to be the victim’s six or seven year old son. The cops did recover a “small” amount of marijuana though, which was apparently enough to charge the parents with child endangerment. Somehow, the people who riddled that child’s home with bullets, killed that child’s pets, and forcibly removed that child’s father – all while the child was looking – were not charged with child endangerment. When the government has the right to bust into tens of thousands of homes in the middle of the night, unannounced, with guns drawn and in full military armor, to take the life of beloved family members, and to menace 6-year old children, all because the homeowner is believed to possess a few grams of a plant or a non-explosive substance, tyranny cannot be said to be on the way. It’s already here. And President Obama wasn’t the one who created it, either. This is tyranny. Our tyranny. It is a sickening mess of imperious power being brandished against our fellow citizens every night. And all of this because of our tacit and unspeaking consent. Do you still give it? Brennan David. Columbia Daily Tribune. 23 February 2010. This is the context of the raid seen above. Do my readers now find it more excusable? Radley Baklo. Cato Institute White Papers. 17 June 2006. An in depth look (170 pages, including citations) of this problem. Full of informative statistics and disturbing case stories.